Ever since Valentine's Day began to be observed on 14th February, the date has got as if a magical significance for people all over the world. You all are probably counting the days to Feb 14, are you not? To add to your festive fun, here we have some cool Valentine recipes that you all can prepare and have a yummy time. Check these out and make some delicious dishes on Valentine's Day. And if have plans to throw a Valentine bash this year, it is all the better, for these recipes are perfect to give your friends a grand treat. To share these Valentine's Day Recipes, click here and refer this page to whoever you want. Wish you all a Happy Valentine's Day! 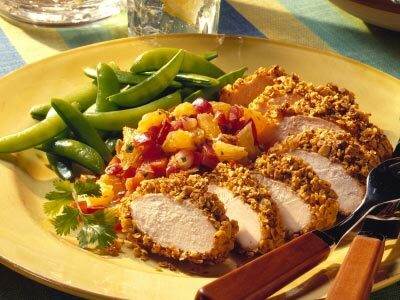 Try out these Valentine's Day Recipes at home and have a grand time with your friends and family. Thickly spread 2 of the brioche slices with the chocolate hazelnut spread, then top with the remaining slices to make 2 sandwiches. Use a large heart-shaped cutter to cut the sandwiches into hearts. Whisk the egg, milk, vanilla and caster sugar in a wide, shallow bowl. Tip the hazelnuts onto a plate. Dip the sandwiches into the egg mixture, leave for 1-2 mins each side to allow the brioche to soak up the liquid, then dip one side of each sandwich into the nuts. 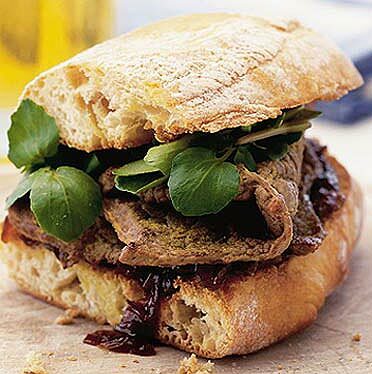 The sandwiches can be chilled like this, covered loosely with cling film, for up to 1 hour. Heat the butter in a wide frying pan until melted and foaming. Add the sandwiches and cook for 1-2 mins each side until golden brown and puffed up. Dust with a little icing sugar and serve with ice cream and raspberries. Heat a little butter in a large frying pan. Once sizzling, ladle in small dollops of the pancake batter, leaving a little space between each, as they will spread out. Put 2 or 3 slices of banana onto the surface of each pancake and cook for 2 mins over a medium heat. When you see bubbles appear between the banana slices, flip the pancakes over and cook for 1 min more, until puffed up and golden. Transfer to a plate and keep warm with the bacon while you cook the rest. 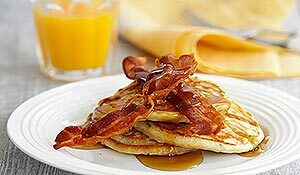 Serve the pancakes with the crispy bacon and a drizzle of maple syrup. Preheat the oven to 350 degrees F. Spray a 10-inch round or tart pan with nonstick cooking spray. This will give a fairly thick crust. If you want a thinner crust, try using a larger pizza pan shape or a 9X13-inch pan (you’ll have to test this out since I’ve only used a 10-inch tart pan). For the dough, in a large bowl, cream together the butter and granulated sugar until smooth. Mix in egg, vanilla, and 1/2 of the lemon zest. Add the dry ingredients and mix until just blended. Press the dough into the prepared pan. Bake the dough for 10-12 minutes, or until very lightly browned. Don’t overbake as the crust will become dry. Cool the crust on a wire rack completely. In a medium bowl, beat the cream cheese until smooth. Add the granulated and powdered sugar, vanilla, lemon juice, and other half of the lemon zest. Spread on the cooled pizza crust to within 1/4-inch of the edges. 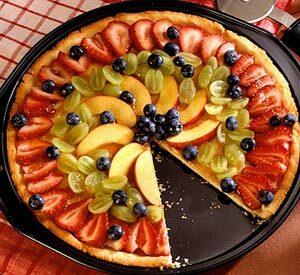 Arrange fruit on top of the pizza. Cover lightly with plastic wrap and chill until serving time. 1) Flour - 2 cups, sifted. 2) Salt - 1 tsp. 4) Baking powder - 4 tsp. 5) Eggs - 2, lightly beaten. 6) Milk (or buttermilk) - 1 3/4 cups. 7) Butter/margarine - 4 tbsp. 1) Preheat griddle over moderate heat. In the meantime, mix the batter. Sift flour, salt, sugar and baking powder in a large-sized bowl (use a real sifter, if you can). Combine egg, milk, and butter in a separate bowl and slowly stir dry. Mix well so lumps won't stick together while you cook. 2) Begin cooking when the griddle gets quite hot. Pour some of the batter into the griddle and get it cooked. Get some help from your parents and bake a regular round pancake from your batter. Using the remaining batter, continue baking small round pancakes in this way. 3) Using a heart-shaped cookie cutter, cut out a perfectly shaped heart from each round pancake piece. 4) Top each cake piece with fresh berries and maple syrup. 1) Add a few drops of red food coloring to the softened cream cheese. Mix until the color is a light pink throughout. 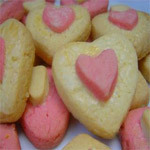 2) Using cookie cutter, cut the bread into heart shapes. Spread cream cheese over the bread. Top with the jam. 1) Cake mix - 1 package, of any flavor (except angel food). 2) Milk - 1 cup. 3) Vanilla Instant Pudding - 1 package (4-serving size). 4) Sugar - 1/4 cup, powdered. 5) Cool Whip - 8 ounces, thawed. 6) Red food coloring - 1/4 teaspoon. 1) Heat oven to 350F. 2) Prepare cake mix as directed on package. 3) Get an 8 inch round baking pan and another 8 inch square baking pan. Grease and flour the two pans. Divide batter evenly between the two baking pans. 4) Bake the batter as per directions given on package. Cool it for 10 minutes and then remove from pans to cool completely on wire racks. 3) In a medium-sized bowl, pour the milk; add pudding mix and sugar. Beat with wire whisk for 2 mins. Add in whipped topping and food coloring. Stir well. 4) Leave square cake whole; cut round cake in half. Assemble pieces by turning square cake to diamond shape and using small amount of pudding mixture holding each half of round cake to the top sides of diamond sides, making a heart shape. 5) Frost cake with rest of the pudding mixture. Garnish with candies or sprinkles. 4) Cocoa powder - 2 tbsp., unsweetened. 5) Powdered sugar - 3 tbsp. 6) Vanilla extract - 1 tsp. 7) Butter - 1 tbsp. 1) Place the bread in a 9 x 13 baking dish. Check that the pieces do not overlap. 2) In a medium-sized bowl, pour the eggs, milk, cocoa powder, sugar and vanilla. Whip well together and pour the batter over bread slices. Turn bread over and over to coat well. 3) Preheat a griddle or a large nonstick skillet to medium-high temperature. Add butter. 4) Place bread slices on griddle. Cook per side for 3 to 4 minutes or until throughly cooked and light brown in colour. Your French toast is ready. Garnish with sliced strawberries or raspberries and powdered sugar, if desired. Serve. 2) Cheddar cheese - 1/2 cup, shredded. 3) Parmesan cheese - 1/2 cup, shredded and freshly-grated. 4) Tomatoes - 2 tbsp., chopped and sun-dried. 5) Garlic - 1 tbsp., minced. 6) Flour - 3/4 cup. 7) Kosher salt - 1/4 tsp. 2) Get a food processor fitted with metal blade. Place all ingredients in its work bowl. Turn on the food processor and pulsate until the mixture forms a neat dough. 3) Pour out the dough on a lightly-floured surface and roll to about 1/4 inch thickness. 4) With a sharp knife, cut triangular shapes out of the circular dough and place on a baking sheet. Some adult supervision is required. 5) Bake the dough for 6 to 8 minutes (or until it turns light brown around the edges).